Intel appears set to try flash caching on the motherboard again with its Z68 chipset. Robson motherboard flash caches, also known as Turbo Memory, failed because the delivered results were crap. Braidwood promised better results but where is it? There is only one mention revealed in a search of Intel's website and it is a limited access page concerned with trace lengths. I think we can say Braidwood has sunk without trace. 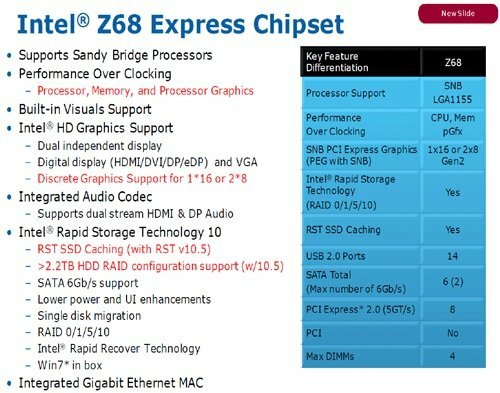 A website called VR-Zone provides an Intel PowerPoint slide showing that the Z68 chipset has RST (Rapid Storage Technology) solid state drive (SSD) caching support. RST is associated with firmware RAID, a feature that can obviate the need for hardware RAID controllers. It looks like Intel has added SSD caching to it, although there are no details available of which SSDs will be used, how large they are, and when the capability will be delivered. If Intel delivers product here then it could be seen as following in the near-design footsteps of Seagate and its Momentum XT disk which has a small (4GB) flash cache inside the drive casing. Seagate has sold 350,000 of these in the year since it was launched.